This enrichment includes group travel & touring, along with individual stays with host families where the students will be immersed in the language & culture of SPAIN. The group touring includes the historic village of Segovia where we will visit the Alcazar, cathedral, and aqueduct.In Madrid we will visit Prado Museum, Parque Retiro, Puerta del Sol, and see a flamenco show. The host family stay will be in the beautiful, traditional, city of Valladolid. 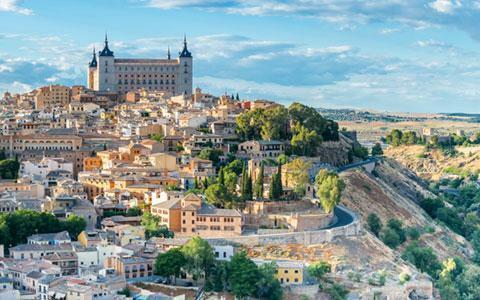 The group touring includes the historic village of Segovia where we will visit the Alcazar, cathedral, and aqueduct.In Madrid we will visit Prado Museum, Parque Retiro, Puerta del Sol, and see a flamenco show. The host family stay will be in the beautiful, traditional, city of Valladolid. Contact jreager@bloomfield.org for more information.